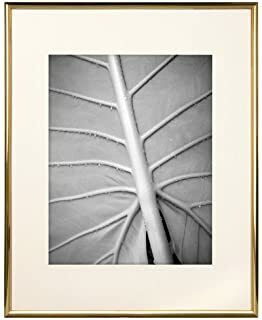 Find a large quantity of match frames (or paint some frames so that they match), print your photos in black & white, then hang the framed photos in a grid. Print your family photos on canvas for an extra special touch. Canvases don’t even need frames–hang the pictures as is! Perhaps print several pictures on different sizes of canvas and then hang them in a cluster. A unique touch is keeping all of the photos black and white, but the changing the frame styles. Hanging the photos with twine is a nice touch, and the layering gives your gallery an extra oomph. You can format your pictures into a grid before printing. Then you could either print on large photo paper and frame it, or you could print on canvas. Beautiful! This idea is super fun: All you need to do is string some twine across a wall and then hang your favorite pictures using clothespins. I love the vintage feel of this idea. Making a beautiful gallery wall is a perfect idea to spice up a hallway and add color. Using color photos will really help your collage stand out against a black framed background. Whether they are in a foyer, your family room, or even a bedroom, the soaring ceiling that come with tall walls look fantastic and create such an open, airy feeling to your home, but when it comes to decorating the adjacent walls, most people are left scratching their heads. Thankfully, we found some tips on what to and not to do when decorating those walls that go on forever. Use large scale art -- Gallery walls and oversized art are probably the most common solution to fill up those tall walls. A large grouping of art or photographs are a great way to fill up the space. Add trim -- Adding trim to your wall is also a great way to break-up the vastness of those soaring, double height walls often found in Foyers and great rooms. Use color and texture -- Here, panels of trim are filled with grasscloth. Printed wallpaper would also look great and create the feel of an art piece. Hang a mirror -- Mirrors are a great alternative to hanging art. Try a large oversized mirror, or a grouping of smaller mirrors. Install shelving -- If you are a book lover, consider adding some custom library shelves and make that open space functional. Distract -- And lastly, a great way to sole the big empty wall syndrome is to distract the eye AWAY from the wall by adding dramatic floor to ceiling curtains, or an oversized light fixture. Wall galleries look simple, but they are not an easy task. We found an article that breaks the process up into steps that will result in a beautiful, slightly offbeat but still balanced wall full of photos and prints that mean the most to you. 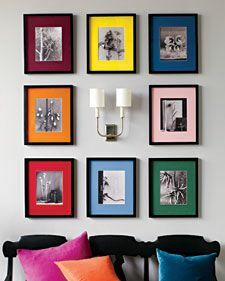 Selecting photos and frames -- Choose a theme and/or a common color palette as a guiding force in your selection process. Remember that displaying simpler images in large scale and more detailed/complex images in small scale results in a more pleasing, less cluttered layout. Designing the layout -- Remember that achieving the asymmetrical-but-balanced look is easier said than done, and it will take a lot of patience. 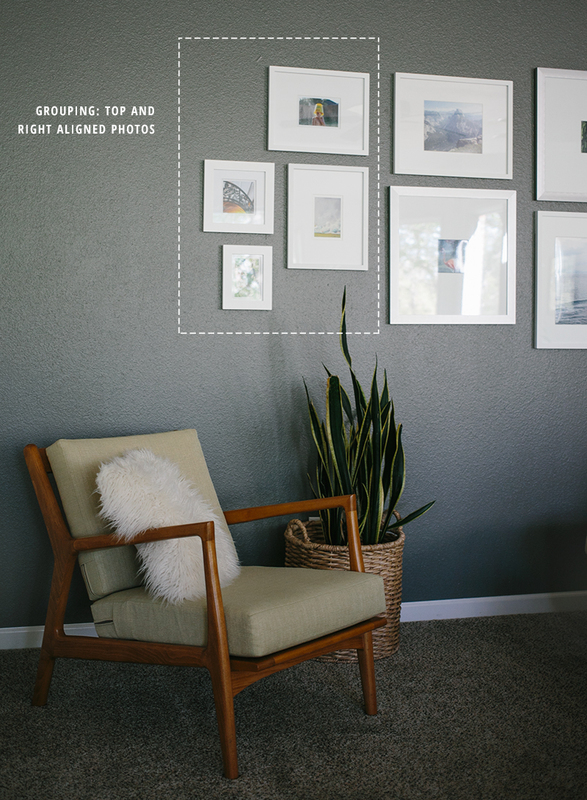 Defining the dimensions -- Start by placing tape on the wall to define the outer boundaries of the photo area so that you can design an arrangement that works well within the available dimensions of the wall. Arranging and re-arranging -- Place all of your framed photos on the floor in the same relative dimensions as the outer boundaries and then experiment (over and over again) with different layouts. It is even okay to eliminate a couple of photos and add some new ones. Give yourself time to get used to the layout before attaching it on the wall to make sure that you really like it. Documenting the layout -- Once you have an arrangement that you are set on, document the overall layout by taking a panoramic photo on your phone (which is easy to do with the iPhone camera app.) Take detailed shots of smaller sets of groupings. The panoramic image allows you to remember the layout of the photos, while the details hots allow you to see the specific alignment of the one image to its neighboring image. To maintain a sense of order, pay close attention to the alignment of the frames and the spacing between them. Different sized frames cannot be consistently aligned or have consistent spacing throughout the overall layout, so work in small groupings and make mini arrangements of consistent alignment and spacing. Remember to have fun with it! Installing on the wall -- When you are ready to transition the photos to the wall, start in the center of the collage, where the largest images are, and work your way out from there. Use the detail photos on your phone to ensure that the alignment of the frames and the general spacing between them are matched up. 3M picture hanging strips are useful for most of the installing process, except for particularly large frames. These will help you hold a picture in the approximate position while using a tape measure to ensure the correct distance from the neighboring frame to make sure it is straight. Press the frame to the wall when it is ready. Remember that this is not the easiest nor the fastest process, but it is something that you will be sure to enjoy for many years to come. Put in a little patience with your work, and it will be worth it. Have twice as much space above the art as below it. There should be at few inches from top the of the couch to the bottom of the artwork. Raising artwork to high above a piece of furniture can make the gap too obvious and seem awkward. Make sure there is a sense of unity between the art and the couch so that it does not look like it is floating alone on the wall. Pay attention to scale to create an overall cohesive look. Wall art that is two thirds the length of a couch is most visually pleasing to the eye. Typically wall art that is anywhere between 50% - 90% the length of the couch looks best. The perfect medium is an even 75%. Try not to hang artwork that is longer than the length of a couch because this creates an unbalanced look causing an unappealing top heavy appearance. Whether you are hanging one large piece or several small pieces paying attention to scale is important in achieving the most aesthetically pleasurable look. Following these basic measurements will create a unified slick look for your room. Be sure to only change any measurement to better compliment your specific room dimensions. Often times when hanging multiple pictures that are both vertical and horizontal you can end up with awkward positioning and strange gaps left between. But if you choose to follow these rules you will not have to face the confusion of deciding which combinations look best. Larger pictures should go on top above smaller images. This creates a smooth equal weight look. Always align horizontally from the top and vertically from the middle. This makes a cross balance that creates an equal look and the aligned rows create a visually calming vibe. Create an imaginary perimeter where you want your group of photos to be and hang them so the outer edges touch upon the established perimeter. Plan out the matting and framing before you set your perimeter so you can properly lay out the format you plan on using. For a more eccentric look you can imagine a oval or loose circle as your perimeter. This works well if you are trying to cover a wide space. Group out the photos on the ground before you hang them to make sure you choose the right format for you. Our photo is an example of balancing two horizontals by placing the vertical in the center. Keeping the grouping together in a balance. Sometimes the hustle and bustle of getting your pictures framed can be a lot of hard work. With online framing you can skip all that and do everything yourself. 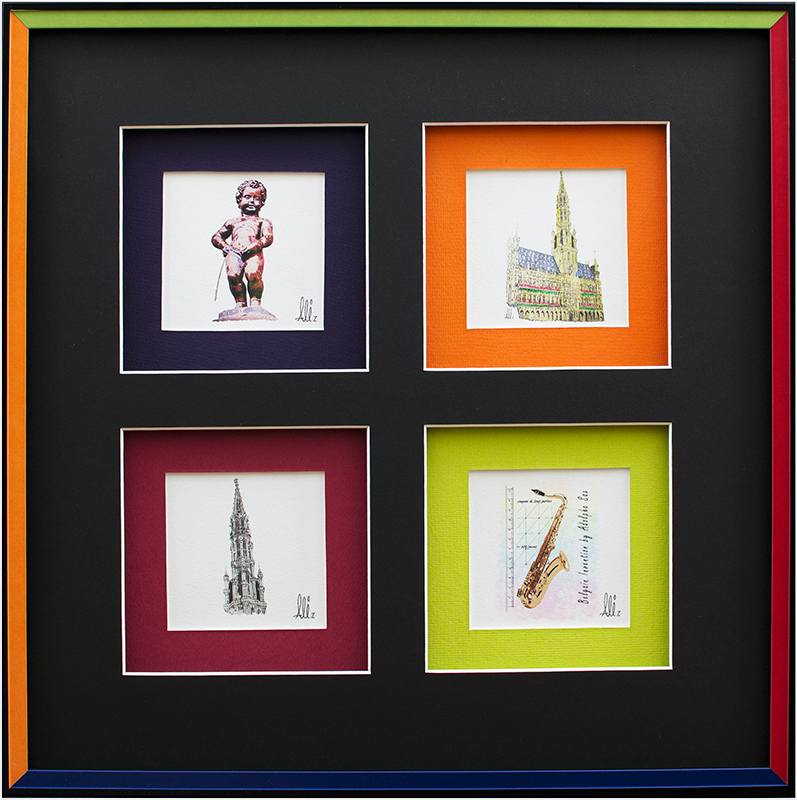 Its as easy as placing an order and voila, your art and frame will come to you. Online framing is a way to make your framing experience easier, more convenient and less expensive than visiting a shop. You can even take pictures off your social media accounts and turn them into beautiful high quality framed art for you and your family and friends to enjoy. The whole process is simple and painless. All you have to do is pick out a piece of art that you want framed; it can be a picture you purchased, a photo you took or artwork that you made yourself, whatever it is that you want framed and on display. Then you visit whatever online framing store you have chosen to work with and pick what size, style and mat you would like. After you have picked your photo and framing style you send it to the online shop of your choice. From there all you have to do is wait for your custom frame to be returned to you. The shop makes the personal frame that you ordered and sends it back when they are done. Easy as that. No wonder online framing is gaining popularity to quickly.